Whether you’re trying to incorporate new routines to get organized for back to school (and all those new outfits), or you’re just looking for a way to make your mornings run smoother, this morning hack will help your entire family get out the door each day. 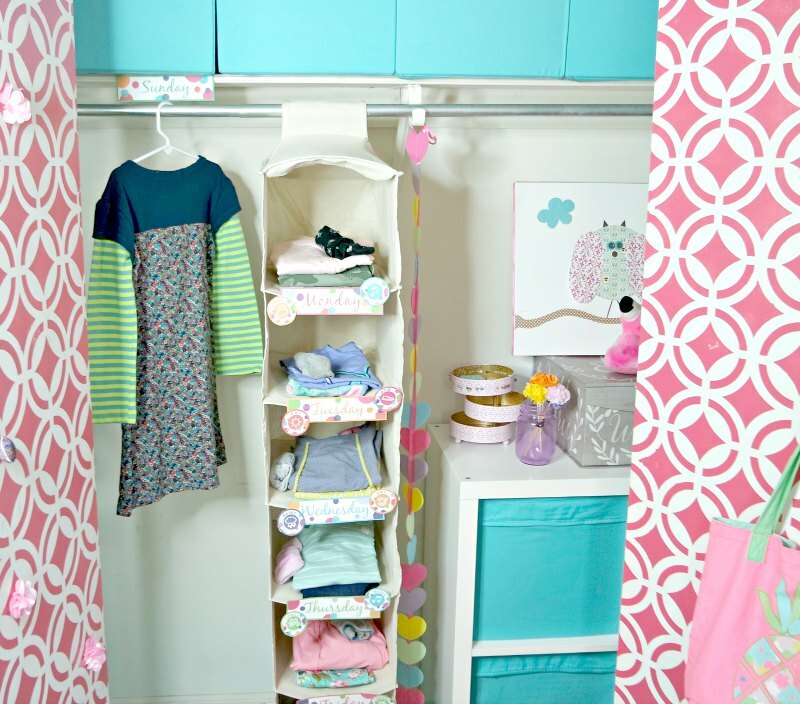 You don’t even need to overhaul your kids’ entire closet to incorporate this. 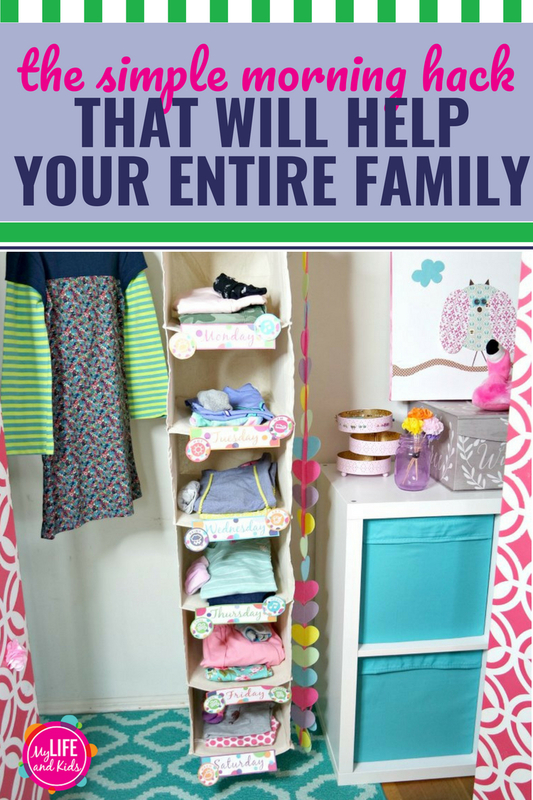 From toddlers to teens (and even adults), use these free printables to get organized now. Normal mornings around here are a little bit hectic. I have kids asking me what the weather is going to be before they can get dressed. Usually my daughter comes downstairs in a dress only to see on the calendar that it’s a gym day. And it never fails that my oldest is irritated because the shirt that he HAS to wear is dirty. Again. 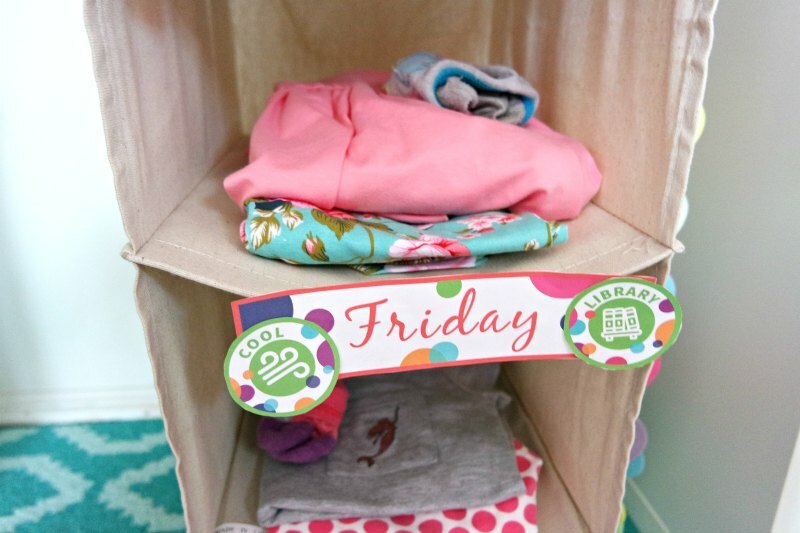 Thanks to one little change in how we organize our clothes, our mornings are AMAZING! Like – we have time for a dance party in the kitchen + a full round of chores before we hop on the bus. It’s incredible! This super simple morning hack has made such a difference in our lives, that I couldn’t wait to share it with you! Click here to download your free printables. 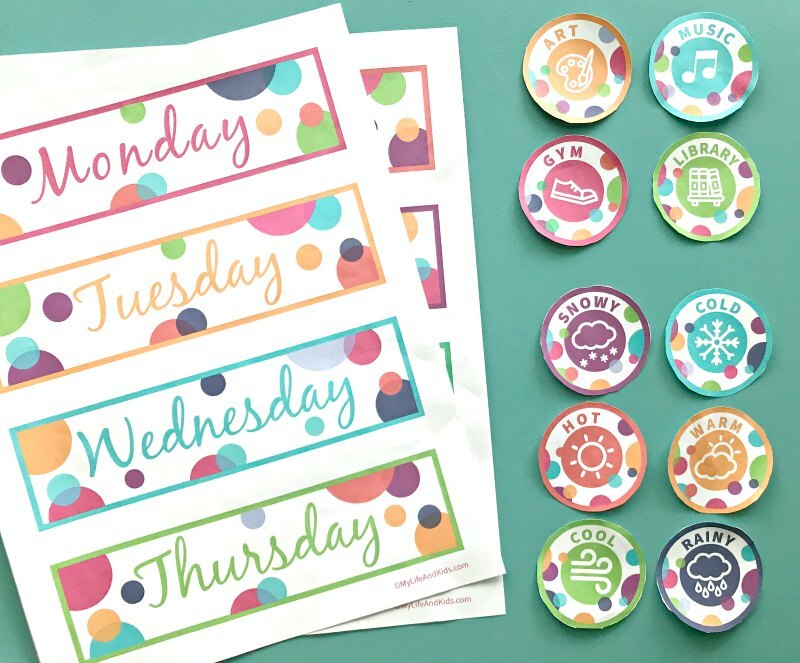 You’ll have all of the days of the week covered, as well as weather cues and school specials (like library, art and gym). 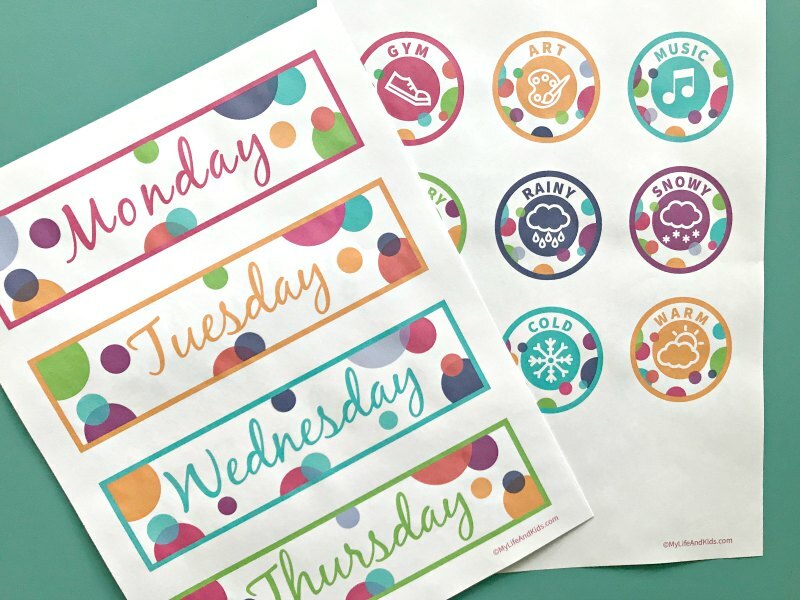 If you haven’t already, click here to download your free printables now. We’ve made this system as flexible as possible, because there are SO many ways to use them. 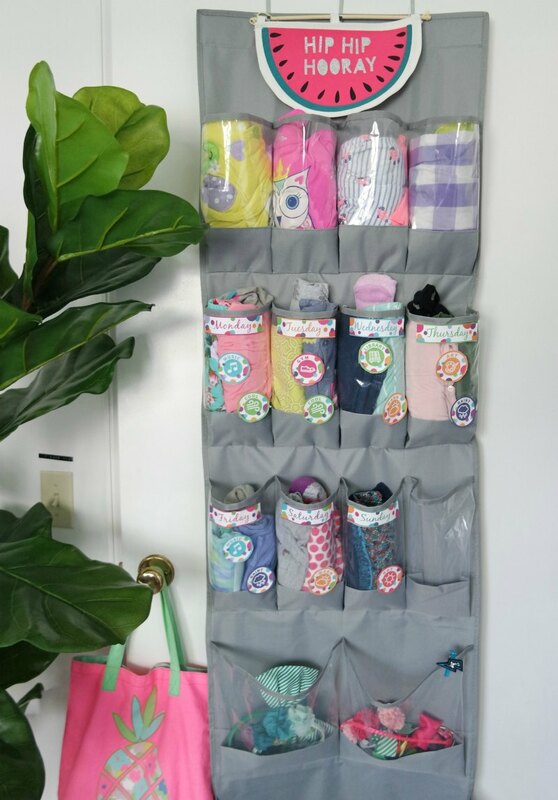 My daughter has a hanging organizer in her closet. Here’s a similar one on Amazon. We attached the days of the week to each shelf, and she can stick the appropriate weather tags and school specials every week. 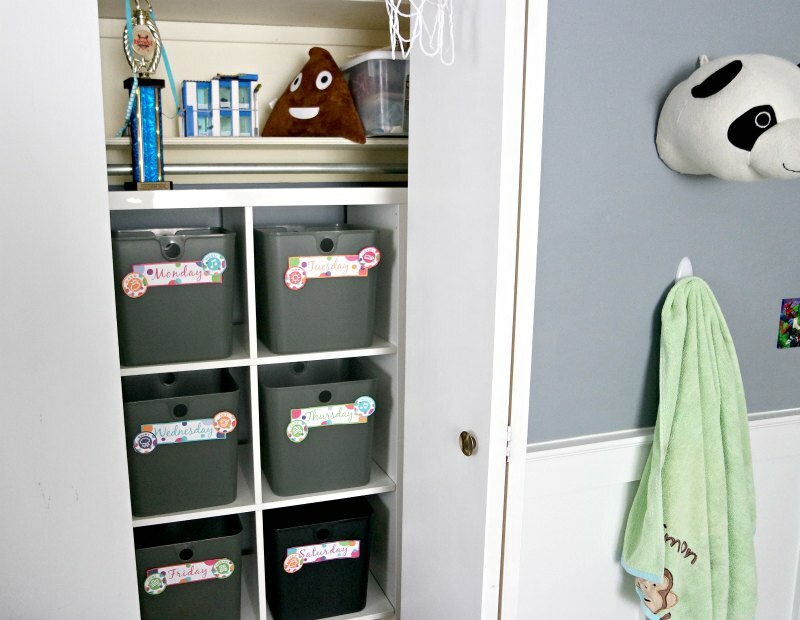 My son has a cube shelf in his closet, and we filled it with bins. Here are similar bins on Amazon. 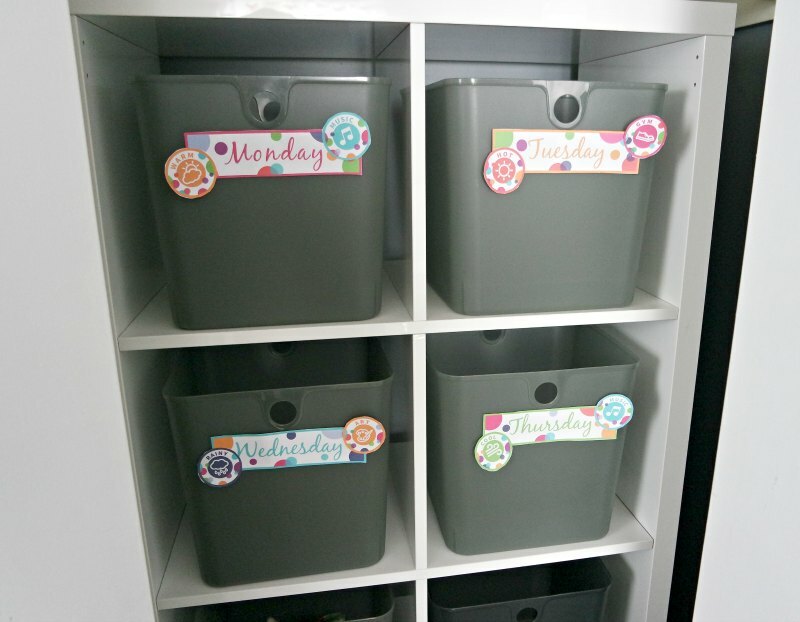 We taped the days of the week to each bin, and he just tosses his clothes into the appropriate bin. It’s a super simple way for him to get dressed by himself every single morning, after I help him make appropriate choices for the entire week. 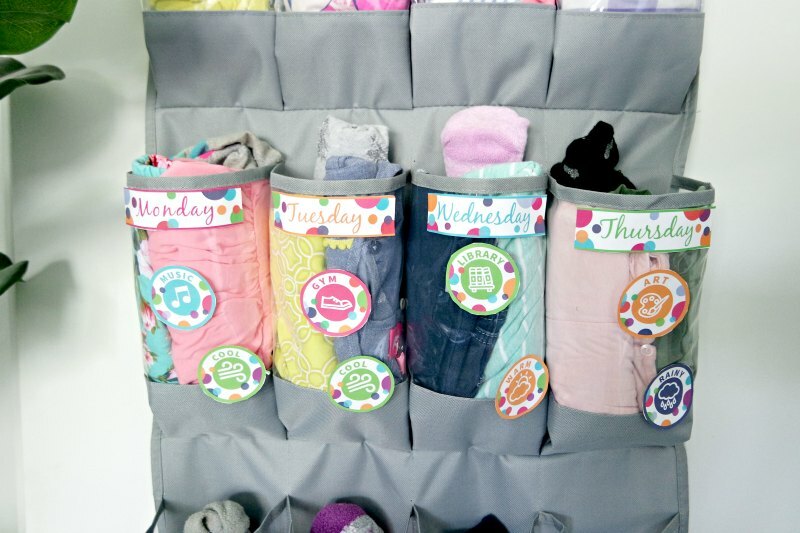 For younger kids, an over-the-door shoe organizer is a great solution. Click here to grab one on Amazon. Simply tape the days of the week on each pocket, and start filling them appropriately. The most important part of your new morning hack system is to USE IT! Once you get into a routine, it’s a super simple and quick way to organize your entire week. I recommend making this part of your normal Sunday routine. Assuming your laundry is finished for the week (good luck! ), have your kids check the weather for the week and put the appropriate tag on each day. Double check to make sure that all specials are added to the correct day. And then help your child choose their outfits for the week. I help my youngest, but my elementary-school kids are able to do this on their own. 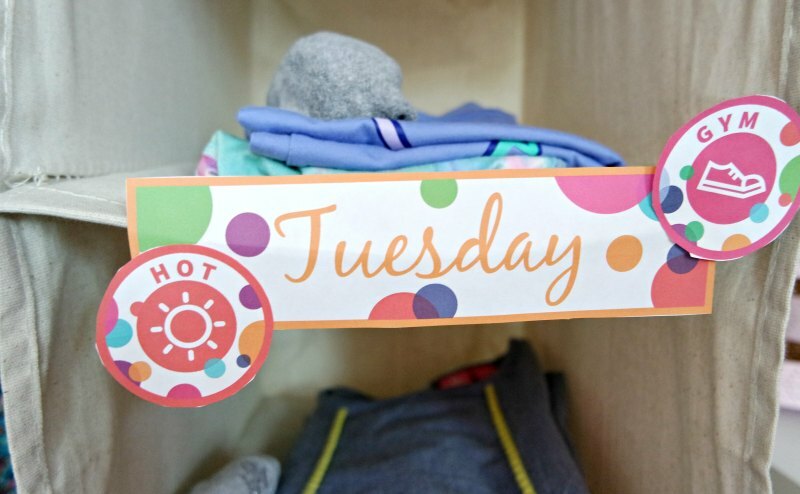 I encourage them to even include their socks and underwear so everything can be on auto-pilot during the week. Bonus! This also helps all of us keep track of whether we need to do any laundry during the week, or if we’re okay to wait until the following weekend. Don’t you love it when a simple solution makes such a huge difference in your life? ← Previous Story 5 Ways to Make This The Best School Year Ever!